Just Another Day...: Recipe Time! Lately I've been scouring the Internet for new recipes. I'm tired of the same old chicken! 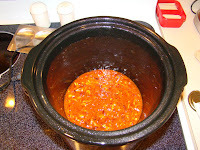 I especially love recipes for my slow cooker. Just dump a bunch of stuff in and forget about it, then have a delicious dinner ready and waiting 5 hours later! I love easy! One of my favorite recipes growing up was Cranberry Chicken. 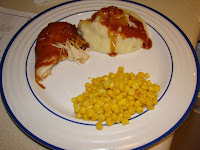 My mom would make this for us--usually for Sunday lunch after church--and I really loved it! She baked it in the oven over rice, so when it was done, you'd have chicken and rice with a super-tasty cranberry dressing. Yum! I asked my mom for the recipe. She remembered most of it. Basically everything but the rice part. Sweet! So my next step was to modify it for the crock-pot. Should be super-simple, right? Well, I will admit that the chicken came out delish, but the rice just never managed to cook so the whole thing turned out soupy with crunchy rice. But have no fear! We ended up ditching the rice for my fabulous mashed potatoes (i.e. backup plan). Since this recipe really is quite good, I thought I might share it with you guys in case any of you are looking for a new and different way to cook the same ol' chicken. Believe it or not, you really don't have to like cranberry sauce to enjoy this recipe. Trust me. Hubs is not a cranberry sauce man but he really likes this dish! So without further adieu, here is the recipe... with pictures even! 1. Rinse chicken with cold water; pat dry. 2. 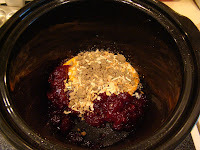 Place cranberry sauce, dressing and onion soup mix in a lightly greased slow cooker. 3. Mix ingredients well, adding a dash or two of salt and pepper. Add chicken to slow cooker, covering it with the soup mixture. 4. Cook for approximately 4 hours on High or 6 hours on Low. 5. Serve over rice and enjoy! Unless you attempted to include rice and some water in the slow cooker like I originally did, in which case the rice would've come out crunchy and inedible. In this case, whip up some mashed potatoes, top 'em with the cranberry sauce mixture and serve with a veggie of your choice! NOTE: This recipe makes enough to feed our family of 3 (keeping in mind LO only ate a bunch of corn). When I cook dinner, hubs and I always split a single chicken breast and it's plenty for us. You can use this same recipe but with 2 chicken breasts and it'll come out just fine!